Jason Orme, Editorial Director at Future Publishing plc, publishers of Homebuilding and Renovating Magazine, the UK’s top selling magazine for self builders and renovators, chose the Sarnafil single ply membrane as the flat roof solution for his personal renovation project. East Midlands based Roof Assured by Sarnafil installer, Manuka Roofing Ltd, installed the membrane on this complex but exciting and prestigious project. Jason took the decision to maximise the insulation of the roof and go all out on reliability by opting for ‘a first rate covering system’ with the Sarnafil single ply membrane flat roofing solution. It was also important that the membrane could not be ripped or ruined, as an area of first floor cladding would need light treatment every few years, so accessing the roof without compromising the membrane was key. Another factor in the decision making process was that the membrane has a special lacquer coating that protects it from air pollution. For this project the Sarnafil system consisted of a loose laid polyethylene vapour control layer, 120mm rigid foil face PIR board, mechanically fixed (into deck) Sarnafil single ply membrane and hot air welded (no naked flames on site) at joints and side upstands. 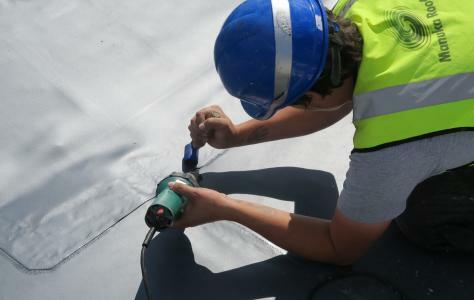 Peter Manning, Sika Ltd, Marketing Manager – Roofing said: “It’s a great endorsement for the Roof Assured by Sarnafil brand to have someone so influential as Jason Orme to specify the Sarnafil membrane for his own personal renovation project. His blog about the installation demonstrates why the Sarnafil single ply membrane was the best solution for this quite complex project. It also gives credit to the quality of the Manuka Roofing installation”.